Medical robots are a fascinating aspect to our technology driven society. As our intelligence grows we ponder new ways to advance our medical knowledge and enhance our capabilities in an effort to save more lives. The da Vinci medical robot system is a half ton machine that costs around 1.4 million dollars, and is currently the most sought after medical technology out there today. Of course it is really no wonder as the capabilities of the da Vinci robotic surgical system are extensive and it has endless possibilities in the life saving arena. Intuitive Surgical is responsible for bringing this medical robot into our hospitals. It was designed by surgeons to allow for a more effective and precise procedure to be executed. How Does the da Vinci Surgical System Functions? The da Vinci machine has four mechanical arms that are extremely flexible. The miniature tools are perfect for all the needs that a surgeon has to make and the tiny cameras, which are in the control of the surgeon at all times, can help make virtually flawless incisions and maneuvers. Although there are always risks with surgeries, a patient’s procedure will now go more smoothly with little or no error. Not to say that all patients will live through or make a full problem-free recovery because let’s face it, every body is different and some people might have underlying conditions which would prevent a perfect recovery. But as far as the procedure itself, it will now be performed exactly the way it is intended and without accidental mistakes that a human hand can sometimes make. The da Vinci robotic surgical system has endured some tricky surgeries thus far and will continue to tackle bigger problematic surgeries in the future. Prostate surgeries, hysterectomies, kidney and heart procedures and even fibroid removals have so far been tackled along with over 80,000 other surgeries in 2007. Since then, this surgical robot has gained in popularity and use for a variety of surgeries. There are many perks that come along with this pricey medical robot. 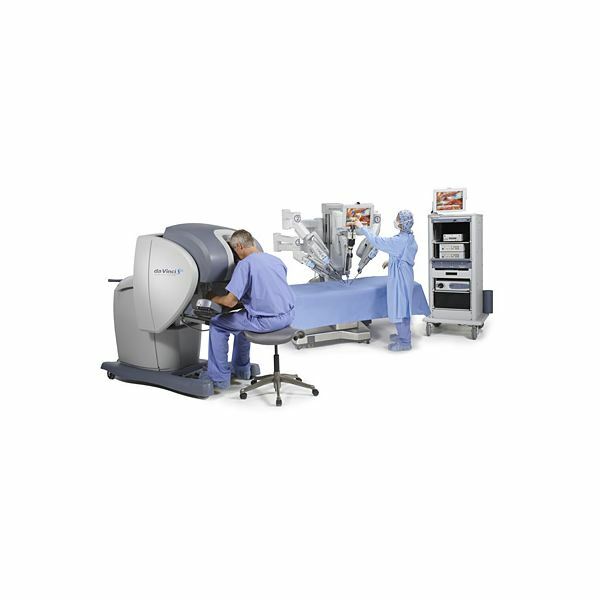 The da Vinci surgical system has rapid tool exchange for fast and efficient procedural tactics, 3D HD images, an interactive display screen so the surgeons can minimize mistakes in judgment and see what normally they might miss, digital zoom to amplify potential problems and high risk areas, and so much more. This makes surgery easier, faster, more effective and minimally invasive which is great news for the patients. So, needless to say, this revolutionary invention has unlocked a potential that has, up until now, only existed in fictional tales. Technology is an advancement that human kind has long since strived to enhance for the good of all people in all places. With medical robots such as the da Vinci robotic surgical system, our knowledge has expanded to new heights which will only prove to save more lives and improve the quality of living for countless individuals.